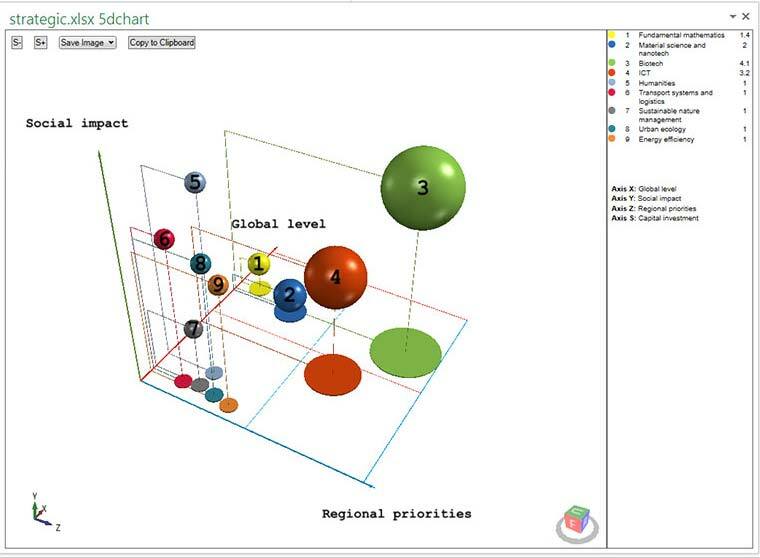 5dchart is an Excel add-in for creating sophisticated bubble charts to represent complex multi-dimensional data. It is used in a diverse set of applications, from portfolio analysis through to strategic planning and representation of scientific data. It supports 3D representation with color and size of bubble . The appearance of charts is edited directly in the Excel spreadsheet, with the resulting image exported in high resolution if needed. There are several controls that determine how a bubble chart is viewed, with rotate, pan, set point of rotation and change field of view. It is also possible to adjust bubble scale and generally adjust the bubble chart until is conveys information in the most clear manner. Many users of Excel will welcome this flexible bubble chart add-in, and at $99.90, and with a free trial there is very little risk associated with trying it. The large number of parameters means that charts can be designed to look just the way a user desires, all in an Excel environment and in an easy-to-use, productive manner. This is certainly the most powerful bubble chart add-in for Excel we have seen.